When I asked participants what they wanted to learn at our community kitchen, one of the responses was a stirfry that doesn't use jarred sauces and is flavourful. At home I make them often to use up the end of the week's vegetables. The only problem is I don't usually follow a recipe, so I needed to document. 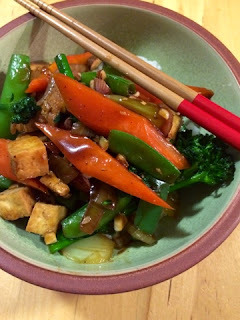 I came home determined to document my stirfry recipe. It turns out this version was declared the "best ever" by one of my regulars at the dinner table. This is by far the highest praise I can ever hope to attain. This recipe is easily adapted to the vegetables and protein you have on hand. This equation works with about 4-6 cups of raw vegetables to this quantity of sauce. Serve over cooked rice or noodles. Optional: 1 tsp fresh minced ginger. 1. 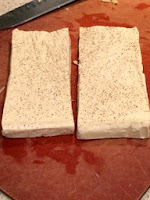 Using paper towel, pat dry the pressed tofu. Sprinkle with salt and pepper. Dice into 1" cubes. 2. Heat 2 tbsp vegetable oil (anything but olive oil!) in wok or frying pan over medium-high heat until hot and shimmering. 3. Add tofu and cook, tossing often, until cubes are slightly golden. 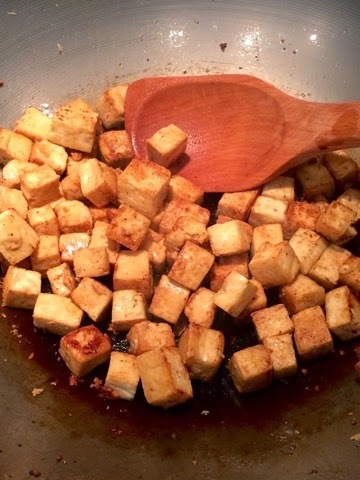 Sprinkle with 1 teaspoon of soy sauce and stir. Remove to a bowl. 4. 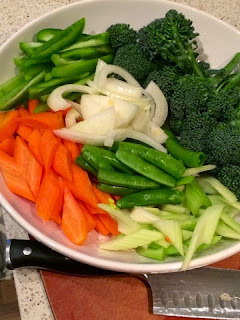 Into same pan, add another tablespoon of oil, then add firmest vegetables first (onions, carrots, etc. ), cook for a few minutes, tossing often, then add the remaining vegetables and cook until crisp-tender. Add tofu back to pan. 5. 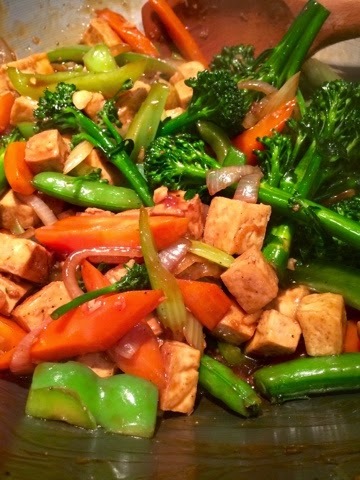 Pour mixed sauce ingredients over hot vegetables and tofu. Continue to stir and cook until sauce is glossy, about 2 to 3 minutes. 6. Sprinkle with crunchy nuts or seeds or serve at table with hot rice or noodles. I am sure you can use any frypan here (except non-stick since no one wants to use those on high heat! or really any heat for that matter...) but I love my carbon steel wok. It has a flat bottom, sloped sides and a helper handle. I can't imagine life without it. You need to wash them well when you get it home (apparently it is coated in thick, non-edible industrial oil to transport and store so it doesn't rust before getting to consumer). Proceed to season it like a cast iron pan before using. But it is true love after that! For some wok care tips, see this article.